Mahad has been known as a port since ancient times. The Gandhharpale caves near Dasgaon still stand witness to this fact. In the same Dasgaon village on the hill between the Savitri river and Dasgaon, the fort named Bhopalgad is today known as Dasgaon fort. Dasgaon fort was a great place to keep an eye on the trade of water and land routes through the Mahad Port. After the Chhatrapati Shivaji Maharaj's reign, when Raigad became the capital, this fort would have become vital to the kingdom. After the British came to power, they restored the fort and changed its name from Bhopalgad to Dasgaon fort. 1 hour is enough to see the fort as there are not much remnants on it. Therefore, it is very easy to visit the fort alongwith Raigad fort, Gandharpale caves and the hot water springs near Sav. The cleft or narrow pass of Dasgaon in on the Mumbai-Goa highway while going towards Mahad from Mumbai. 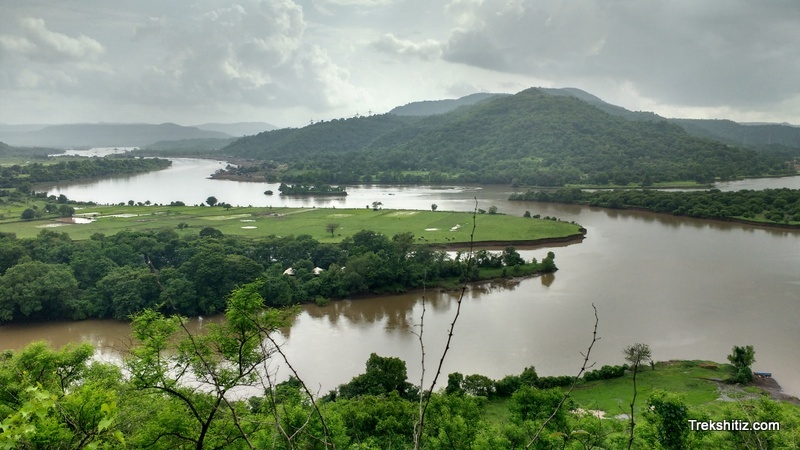 On the right side of the pass is the fort of Dasgaon (on the side of Savitri river and the Konkan Railway track). A small road in front of the pass goes to Dasgaon village on the right. It takes 5 minutes to walk back to the pass by the road. A road built by cement near the passage leads to Zilla Parishad's school at the half height of the hill of the fort. It takes 5 minutes to get to the school by this paved way. On the front of the main entrance of the school, a passage takes us to the mountain. The fort trail starts from here. This passage goes further beyond the school's top (hill on the right side and the school on the left). In 5 minutes you come to a flat surface. Moving ahead by avoiding the open area one can reach the water tank which is carved in stone by keeping the valley on the left side. Going back on the same path we come across two ways. One path takes us to the fort top while the other takes us to backside of the fort on the opposite side of Dasgaon village. First, start by the path going on top of the fort. As this path is not in use it is covered by thick vegetation. It takes 5 minutes to reach the top. There are some ruined remains on top. Because of the dense vegetation cover, fortification wall has been hidden in it. Its remains are visible. Get down to the place where three paths meet and take the left route. From here a path circumvents the hill. This spot displays the importance of the fort's location i.e. the confluence of Kalu and Savitri rivers. Thus this fort served as an important watch tower for the land and water trade routes. By Road: - Dasgaon is 162 kms from Mumbai on the Mumbai-Goa highway. (11 kms before Mahad). All ST buses going to Konkan stop at Dasgaon. By rail: - Get down at Veer station on the Konkan Railway route. Distance from Veer railway station to Dasgaon is 5 km. Autos are available to reach Dasgaon. Water on the fort is unfit for drinking.